​Kaw Valley Hearing is a premier provider of quality hearing aid accessories in Bonner Springs and Lawrence, Kansas and the surrounding areas. Our goal is to assist you with your hearing so you can enjoy the simple, yet beautiful sounds of everyday living. With the latest advancements in digital hearing technology, hearing aids have far surpassed what they used to be. Today’s digital hearing aids offer a range of auditory assistance to greatly improve your hearing and quality of life. When you consult with an audiologist from Kaw Valley Hearing, you will undergo a hearing exam and hearing test to determine your current levels of hearing. Our state-of-the-art hearing healthcare center will assist you with selecting the treatment plan that is best suited to your needs. Our hearing aid center offers a wide range of therapies and services including tinnitus therapy, hearing loss treatment and a variety of audiology services. Our patient-centered approach to hearing healthcare means each patient’s needs are always a priority. Whether hearing aid repair, hearing protection, tinnitus treatment, or aural rehabilitation is needed, a skilled audiology specialist can provide the right solutions. They will discuss your cosmetic preferences, your budget and your hearing needs to determine the hearing aid options that are right for you. From choosing the right size and battery life to volume control and capabilities, we will assist you every step of the way to select the best hearing aids for your needs. Contact a hearing aid provider from Kaw Valley Hearing to schedule a hearing test by calling our Lawrence office at (785) 856-4200 or our Bonner Springs office at (913) 991-2329 today. Kaw Valley Hearing is excited to announce the addition of video otoscopy. 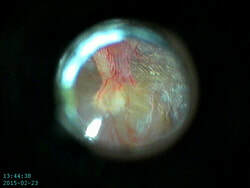 Video otoscopy is an invaluable tool for communicating clinical information about the outer and middle ear with referring physicians. For example, if there is an underlying acute outer or middle ear pathology, occlusion, or dermatological condition, it may require treatment with resolution prior to the hearing examination or fitting of the hearing device. This is included with all routine examinations for the benefit of our patients.